Edition #527 of my chart, now in its 20th year, begs the question: What do you do when you enjoy all of the songs at the top of your chart so much? So in a BILLCS Top 30 chart first, songs 1 through 7 remain the same. Miguel’s “Pineapple Skies” gets its 3rd appearance (6th week, above) at #1, while Billboard Top 40 hit “Sky Walker” stays steady at #3, and “Told You So” (below) rises 20-17. They’re all from the compelling and enjoyable War and Leisure album. YEBBA’s “Evergreen” (above) holds tight at #6, while her duet with Sam Smith, “No Peace”, inches up to #12. This compelling new singer continues to be one to watch, and more proof is available in the form of a song recorded live called “My Mind” (below), which is available for free download, or you can make a donation, with proceeds going to Bring Change To Mind, an organization to assist people with mental illnesses. It’s available from her website right here. Its video has over a million views. New to the Top 10 is SoCal production duo waitwhat with “Alive” rising 11-9 featuring a provocative vocal by Rielle. The songs just below the Top 10 are kind of stuck this week, slinking up the chart by 1, 2, 3, 4, or 5 positions, save one song, the fastest riser. “Moves” will keep you dancing courtesy of Italy’s Big Fish featuring American singer Mike Gomes, rising 26-21. It’s a 2-for-4 deal with River Tiber’s “Patience” (above) climbing 24-20, while K-POP stars BTS are up 27-23 with “DNA” (below). Keeping the doors wide open is Mika with the jaunty and inspiring “It’s My House” climbing 22-18. Putting a huge wrinkle into the chart which will ultimately play out in two weeks is Troye Sivan’s new single “My My My!” (at the top), which soars into the chart at #16. It would have been higher had most of the songs above it not been frozen this week. This is the breakthrough single that everyone had hoped for, a joyous mid-tempo dance song that sees Troye flashing his moves in the fun video. It was immediately followed up this week by the more pensive “The Good Side” (below performance from Saturday Night Live). Arriving at #26 is NYC singer Reigen with “Dreams”. I wrote about this cover of The Cranberries 1994 hit shortly before the sudden passing of its singer, Dolores O’Riordan. Reigen recorded it as an ode to the marriage of his friends. While his version has suddenly taken on a bittersweet quality with Dolores’ passing, Reigen’s cover should always be regarded for what was intended. It’s Reigen’s second chart appearance, following 2014’s #2 “Come Back To Me”. Debuting on the chart as lead artists rather than remixers are L.A. duo Two Friends with “Just A Kid” at #27, featuring a playful vocal by singer Kevin Writer. Matt and Eli have already been to the Top 10 twice with their fine remixes of Mako’s “Way Back Home” (#10) and MAX’s “Lights Down Low” (#3), which looks to finally crack the Billboard Top 40 after nearly two years on release!! Il l’a fait à nouveau! Pour nous encore 🙂 After having such a massive hit in French-speaking places a few years back with the jaunty “Elle Me Dit”, the ever-talented Mika once again looks to French culture and language for the entertaining “Boum Boum Boum” and its fun animated video. When I saw Mika’s stripped down acoustic piano show in Toronto last year, there were a lot of French speakers in the audience who knew every word to “Elle Me Dit”. So I’ll take Mika singing in either language any day, just no need to translate this one into English. The Origin Of Love was indeed a lovely but very deep album, which I think kept some older Mika fans away, so I’m hoping the singer goes for lighter fare this time as I think it will serve him well. You can buy “Boum Boum Boum” right now on iTunes. For someone who was never really impressed with Kylie’s early 80s/90s songs, which of course garnered massive success in the majority of the world, I must say that the calibre of new songs on the way must be substantial. Witness 2012’s 3rd career reinvention (following the early 00’s grands succès) with the stunning “Timebomb”, a song that really was only a huge hit in her native Australia, but greatly loved by fans and music bloggers around the world. “Skirt” continues in the next phase of that reinvention that will leave the dance floor in dubsteppy tatters. Produced by Nom de Strip and co-written by The-Dream, “Skirt” is effortlessly flirty, something that singers more than 20 years younger than Dame Kylie simply can’t pull off. I hope this one gets official release soon and that her record company pump the hell out of it. One of the best songs to make your summer brighter!! Our favourite UK musical alchemist is back! 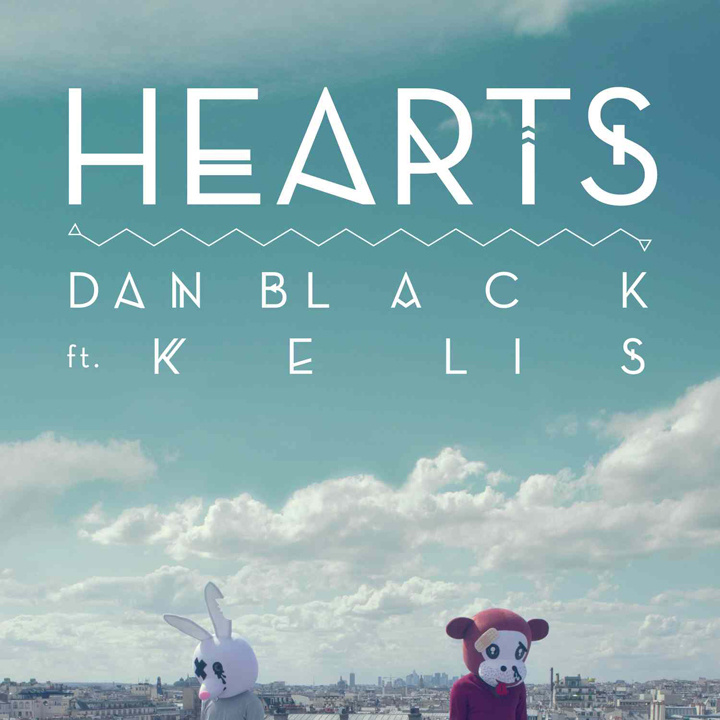 Based in Paris, Dan Black took a break after scoring with his 2009 album UN to start a family (his songs “Symphonies” and “Alone” both got to #1 on my chart). He dropped a few songs over the last year or so, but none have resonated so much as “Hearts”, which adds Kelis into his crazy kind of musical magic. “Hearts” is destined for both the radio and the beach (and perhaps remixes for dance clubs), making you wonder every step of the way what musical moment will occur next in the song. It’s also supported by a 24 hour stop motion video which must have been quite difficult to film. You can never say that Dan Black doesn’t sacrifice personal endurance for his craft! “Hearts” is one of those songs almost out of left field that just doesn’t let go. In follow up to singles “Miss Unknown” and “Marching (In The Name Of Love)”, Sweden’s Eric Saade has released an EP Coming Home (along with the title track single – unfortunately not among his best songs I’m afraid), in advance of his upcoming album Forgive Me. The songs are definitely taking a different direction away from the brilliant arpeggio-laden Europop in favour of ballads and R&B-influenced songs. “Cover Girl Part II” (above) is probably the funkiest song that Eric has ever recorded, sounding sultry and fly like never before. This blends nicely into the R&B-oriented charge of male pop singers that has been led by Justin Timberlake this year. It will be on the album, but I’m not sure about the days-old “Winning Ground” (below), which does not appear on the Coming Home EP. Eric loves soccer so it must be a thrill to perform an anthem for the Women’s Euro Sweden team. Like any soccer anthem that manages not to go over the top, “Winning Ground” is memorable and oh so catchy… just not sure how much an official release it might be. Eric Saade proves himself to be a reliable pop star and I look forward to hearing more new songs from Forgive Me. Mika is such an inspired singer and performer sometimes it just seems surreal. So just weeks after the Tim Burton-influenced video for “Popular Song” (featuring Ariana Grande) arrives on the scene, we find Mika sharing the video with “Citizens From A Place Called World” for this lesson in positive summer power called “Live Your Life”. And the singer lends his multi-language skills to the song by singing a verse in Spanish. So first there’s a Home Depot commercial on TV that uses “Love Today” as its music, and now there’s “Live Your Life”, which you might not realize until the end, is actually a video-length beer commercial for the San Miguel beer company. Sold! Not sure if it will be available for commercial purchase though. In a world of mirror images, you will find Star Trek’s Mr. Spock with a beard. You will find Griffin Dunne’s character trying to find his way home through an unforgiving New York City in Martin Scorcese’s 80’s classic “After Hours”. You’ll find the Log Lady from “Twin Peaks”. It will all be set to classic 80’s chilled out new wave – Cocteau Twins, Thompson Twins ballads, Gary Numan instrumentals… and as summer approaches, thus we find “Colder” by Amelia’s Fault. This ‘project’ combines the many talents of Matt “Stormby” Eriksson, Richard Hymas, and Charlie Mason, who craft a song worthy to be featured alongside classics like Depeche Mode’s “Stripped” or “Somebody”. They selected the perfect vocalist – Color Theory (aka Brian Hazard), who is already well known for his Dave Gahan-like vocals. It’s the voice that gets the lyrics and melody stuck in our heads – “Colder” doesn’t convince so much on first listen as it does on fourth. It… lingers. And then, it’s embedded. Yes, during the summer months you can chill out to “Colder” and be completely content! Watch the lyrics video below… and blame it all on Amelia, whoever she may be. U.S. residents can download it for free via Amazon. I know that zeroing in on a song from Mika’s The Origin Of Love album since last Fall may have been difficult, especially with the multiple videos which didn’t seem to help promote the album very well. First, “Make You Happy”, then “Celebrate”, and more recently “Underwater”, whose video was spell-binding, until the end which left a rather poor aftertaste. Nevertheless seeing Mika for the first time in concert a few weeks ago was a real treat, he is an amazing showman, and it was still so surprising to hear how many fans knew all the lyrics to his songs from Life In Cartoon Motion six years later. The focal song for me from The Origin Of Love has always been “Popular Song”, with its playful inclusion of the chorus of “Popular” from the play “Wicked”, so much that I’ve already charted the song twice, in its original album version and then with this Ariana Grande version, which has now surfaced as a video. If there’s a song to reignite interest in the album, it’s “Popular Song”, and this immensely fun and Tim Burton-inspired video (with its bullying theme undercurrent, note! ), full of style and delightful ghastly humour. Now that PSB have finally left Parlophone after their 25 years with them, Neil Tennant and Chris Lowe return to the classic PSB sound of 20+ years ago with “Axis” from their upcoming album Electric, released on their own X2 label. While “Axis” might be an official single, to me this is just PSB whetting our appetite for what are likely to be much, much different songs than on their last (and IMO weakest) album Elysium. “Axis” is the buoyant, layered stuff that paved the way for current EDM/electronica, and it’s primarily an instrumental, which reminds me of many a PSB B-side. Look for a second single to bring the Boys back in true style along with the album release. Then there’s a tour which appears to be taking them everywhere, including my city (Toronto) on September 25. Absolutely can’t wait. Say what you will about The Wanted, I think they’ve got a lot of strong vocal talent which is also blessed with songs from very good songwriters indeed. “Walks Like Rihanna” may seem obvious but quite truly you will neither be able to escape this song in the coming summer nor will you be able to get it out of your heads. And that’s what is setting the quintet apart from other current boy bands. Not out for sale until June 23 unless that’s bumped up. “Look Around You” neatly joins songs about which I’ve been writing lately that might bring disco music back to its heyday. Note: You will get sick of me saying this in upcoming blog posts, so be warned 🙂 Taking its cues from turn of the century house music – not surprising since German producer Boris last teamed with the essential Róisín around that time with “Never Enough” – “Look Around You” beckons you to move with a sultry and polished Róisín vocal. More like this, please! For sale on May 17.